We got to PNC Park around 4:15pm and did a little walking around outside it along with a stop at the Team Shop before the park officially opened. There are a few interesting statues outside including one of Roberto Clemente that has Hallowed ground from where he played in Puerto Rico and Pittsburgh. Around 5pm they opened the center field gate and we went into the river walk part of the park. There really was not much to do besides see another piece of Forbes Field's wall (more on seeing the actual site of Forbes Field when I eventually get caught up to that). 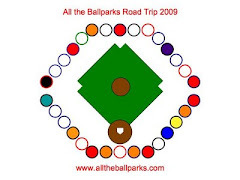 It was actually kind of weird because we were in the park, but not really because even the outfield sections where you would normally go to catch batting practice before the rest of the park opens had gates closing off every section. Finally at 5:30pm the park really opened. To get anywhere in the park we had to go up an elevator and just ended up going straight to our seats, so Mik and I did not really explore the park, since I preferred to stay seated and not try to rush back before the game started. The seats were pretty good, especially the view of the scoreboard, which was very important for this game, since we got a scoreboard message for Mik. Up until the bottom of the 9th inning the highlight of the game was the Pierogi race. This is almost the best race in MLB, but I still think the Nats Presidents Race is the best. The Hannah one, which I think is jalapeno won the race this time. The Indians took a lead scoring 4 runs in the top of third with the help of three base on balls, two singles, and a triple. They added another run with a homer in the sixth. The Pirates got their first run with a lead off homer in the bottom of the 9th by Adam LaRoche. They then went on to get three more runs and get back around to Adam with 2 outs and the bases loaded. He ended up ending the inning and the game by flying to right field, but boy was it an exciting almost come back game. I was kind of rooting for the home team Pirates, but Mik was rooting for the Indians. I guess the free hats really converted him to an Indians fan or at least that is his favorite American League team now. When we got back to the car after the game I asked him what his favorite part of his birthday was and he said the Indians winning. I really thought he would have said the mini cake at DQ or the pierogis at the park, but for once the food was not the highlight for him even though it was great. As for PNC Park and them boasting about being the best ballpark, I do not know. I am still very partial to Wrigley as the best, but I got to give PNC credit for being a pretty good park. They definitely have very few cons with the main reason Wrigley winning out being its history and its old scoreboard charm. Pierogis sure win over giant pretzel, but barely. They did not have any stickers at the Louisville Slugger Museum, but we did find a 125 anniversary Louisville Slugger magnet. We got it and put it on the back of the car next to the KC Kansas City Royals one we had got before finding stickers for the Royals. At the Louisville Slugger Museum we each got a free mini bat at the end of the factory tour. Mik and I got the regular one they give out and Dad got a special one for Father's Day. The regular one is a natural color one. It has the museum's logo on it in black ink. Parking at Comerica Park was easy to find right in front of the ballpark. They have a surface lot just for handicap parking. They are not official handicap spots for the most part, but they place cones in every other spot, so actually it is even better than handicap parking spots, since this makes every spot van accessible on both sides. It is not cheap parking at $25, but it was worth the convenience of being right next to the park and the Team Shop (Dad was able to put the souvenirs in the car before the game so we did not have to drag them around). Getting inside the park is pretty easy, although it seems you have to go through the one that says no bags to be checked through, as all the other areas seemed to have turnstiles. However, they did not even seem to mind other people going through that line and needing their bags checked, since there were not that many people going in at that time. Getting around the main concourse of the park is pretty easy. There are a few areas that have steps up to (ferris wheel and carousel), but the ramped way up is nearby. Just walking around the park on the first level, though, is rather flat. It is a little hard to navigate through at parts because the concourse is not very big and the crowds were heavy, such as behind the bleachers and by the statues behind center field. Our seats were located in the upper deck in section 343. The first usher we encountered tried to put us in the wrong seats and was rather clueless, but later the usher from a nearby section came by and said basically that if we needed any further help he would be better able to help. The seats had a great view of the field. The bar in front of us was somewhat in the way, especially since the seats were so far back from it, but mostly it just blocked the view of the foul territory and a little chunk of left field. The view of the scoreboard was awesome, as we were rather close to it, but at a good angle to still be able to see most of it. Just a little bit of the left screen was hard to see, but nothing important was put there. There were cup holders, but the ones on the bar for wheelchairs blocked the view according to Mik. The other cup holders were in the arm rests and did not work very good since the arm rests were very short and not long ones like in movie theaters. Plus, mine was between me and Mik and Mik kept leaning over and would have certainly knocked the drink over if I had put it there. Thus while it did have cup holders, they were disappointing, especially for it being a newer ballpark. It is just plain sad that Wrigley Field rates higher in the cup holder situation, which is one of Mik's top things he looks for accessibility wise at the seats. Overall Comerica Park would get a great accessibility rating from us, but the leaving the ballpark situation kind of tainted the feelings about the park. Getting up to the seats on the elevator was not hard, although they did cram in several that were just riding to get to the suite/club level. At the end of the game, however, it became apparent that the elevator situation was not very good because the line for the two elevators was out the door and it did not even look like most of those people really need an elevator. Plus, who knows how many they were letting on at the club level. We decided to take the ramps down, which we found not too bad to do at Wrigley. However, the whole ramp was extremely packed with people. I think it was because we went down the one near the escalators and they did not have the escalators going down. Also, the ramps are probably only half as wide as the ones at Wrigley. We could not find any single stickers at Comerica Park for the car, but we found a sheet of logo stickers that had some interesting ones on it. Dad ended up making a combo sticker like he did for the Royals. 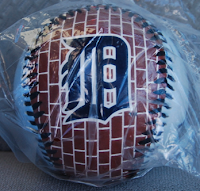 He used one sticker with the Tigers D logo in a baseball mitt and one that said Detroit Tigers. 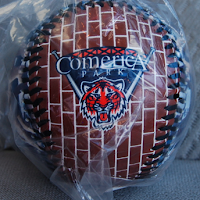 One of the two baseballs I got at Comerica Park was a 25th Anniversary one. 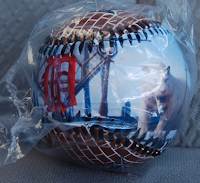 This ball commemorates the Tigers winning their last World Series in 1984 when they triumphed over the Padres. The ball has a 25th Anniversary logo that says World Series Champions in a ribbon above the 25 and a ribbon that says 1984 and 20099 with a Detroit Tigers D logo in the middle. On one strip of the ball their is a SD Padres logo on one side, a little version of the 25th logo in the middle, and a Tigers D logo on the other side. Opposite the big 25th logo is World Series 1984 logo.